OK, so sometimes I get distracted when I’m running. It doesn’t take much. 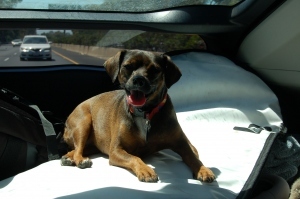 Home remodeling projects, cool gardens, cute dogs, nice plants, Airstream camper trailers, bad landscaping, piles of trash.. I will stop for all of the above. 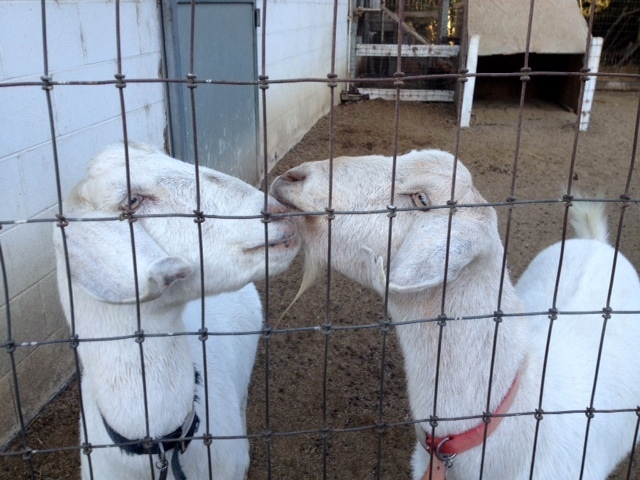 The kissing goats of Vereda del Ciervo got my attention on Saturday with their frantic antics. I’ll let them tell you about it. 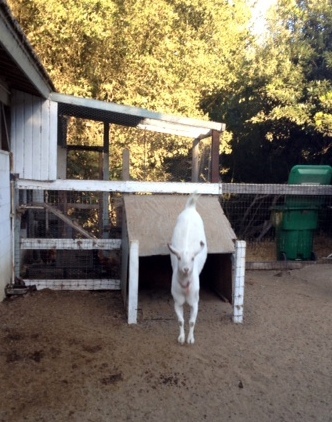 Thanks for the fun visit, VDC goats! See you soon. 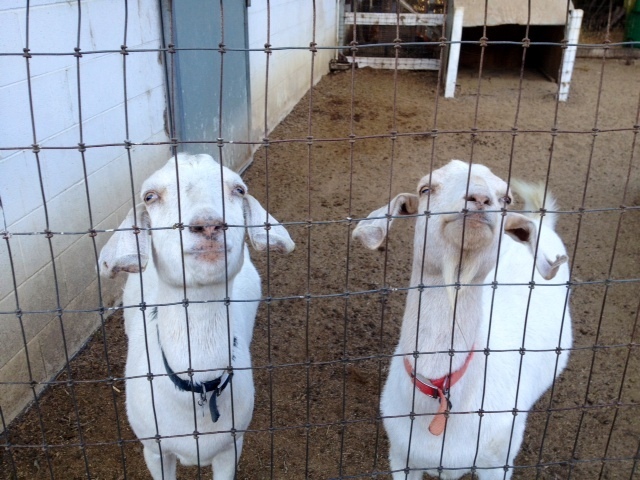 By the way, these goats have it good. 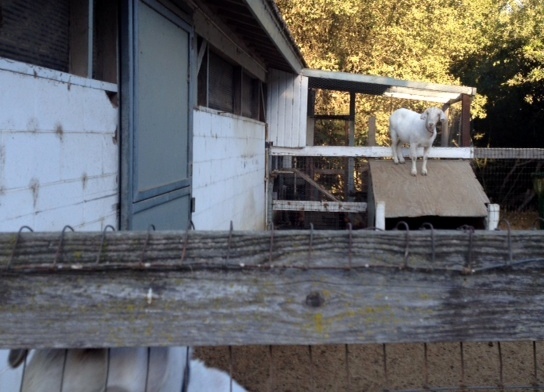 They don’t have to work for a living like the brush clearning goats, and they have a nice clean pen and are obviously well fed. Of course, they might rather be wandering the roads of Banff in Alberta, Canada, but then you really have to pose for photos all the darn day. Liz and I kayaking. Photo by Boris. 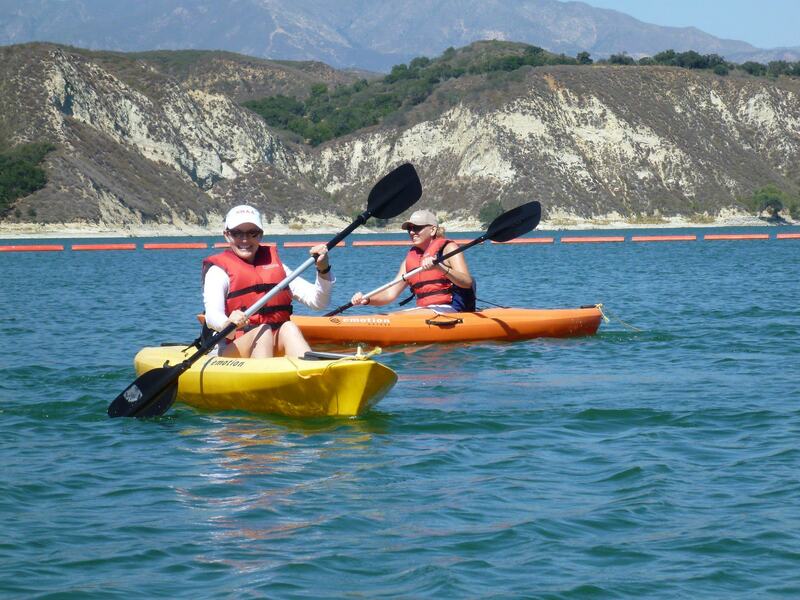 It’s been over a year since the County Parks Department relaxed its rules on water activities at Cachuma Lake County Park, meaning that you can now kayak on the lake. Unfortunately, their allowance of stand up paddleboarding didn’t last, and that’s now prohibited. Swimming is still not allowed (because the lake is a source of drinking water), so it probably became apparent that inexperienced paddlboarders become swimmers pretty quickly. But you can rent a kayak at the boat dock for just $10 an hour, so on Sunday Liz, Boris and I hit the water for some paddling. The weather was hot and perfect. We couldn’t have asked for a better summer day. Cruised up to the rental kiosk, threw down a deposit and minutes later we were on the water. No safety instructions, they just told us not to land the kayaks under any circumstances. 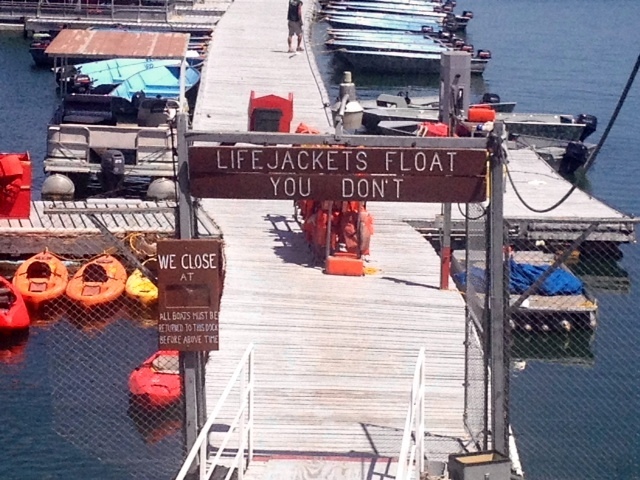 Oh, and to watch out for motorboats. It brought back memories of taking the lake’s Eagle Cruise with my grandmother, taking a motorboat out with my Dad and brother, and stopping by for various newspaper assignments. I’ve never camped at the lake and wouldn’t count it as one of my favorite local spots, but kayaking is always fun. We cruised along the shore, had some bumper boat moments, took a bunch of photos, and then hit windy waters as we turned a corner toward Bradbury Dam. It was actually windy enough that there was decent swell in the water. We got a little wet! Paddled about halfway across and then decided to head back to the dock. 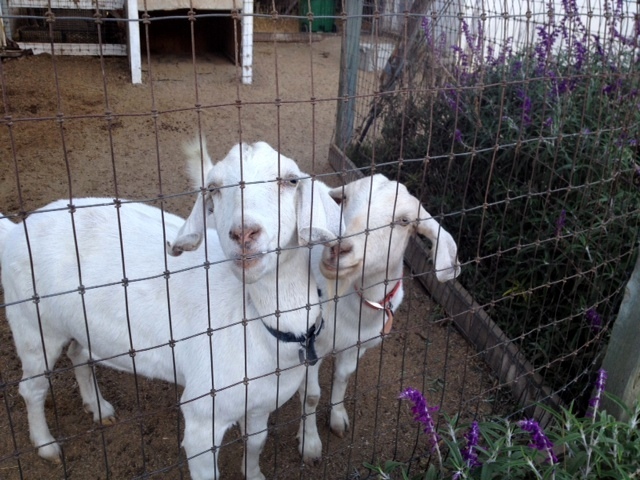 Then we cruised to Los Olivos for coffee and cupcakes. (No wine, although Liz did pick up her wine club shipment.) 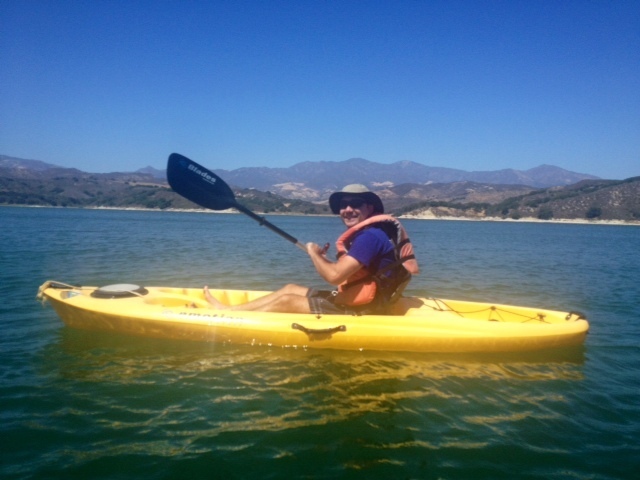 If you’re looking for a fun, inexpensive afternoon in beauteous Santa Barbara County, put kayaking on the lake on your list. Boris is a happy kayaker. One of those old school warnings you hope they never tear down. 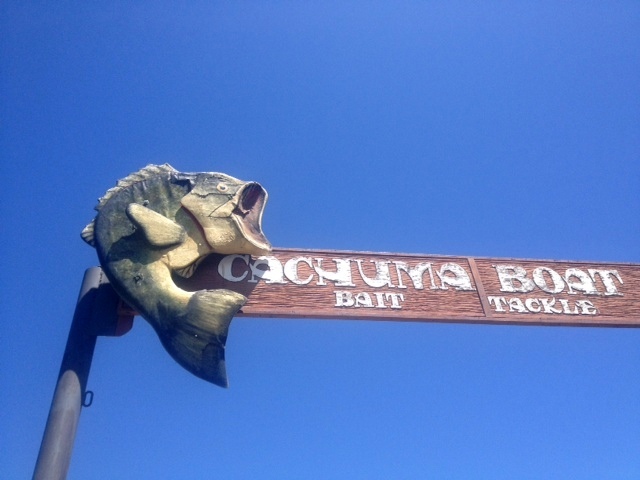 Something’s fishy at Cachuma Lake. Stupid thing to take a picture of, but I just liked the color of the red bag against the dark beach. After UCSB graduation in June there were mylar ballons on the beach every day for a week. I guess people let them go after their parties and they drifted away. Picking up all those balloons really made me mad. Cleaning up bottle rocket detritus after the Fourth of July didn’t bother me as much. That’s all I’ve got for today. 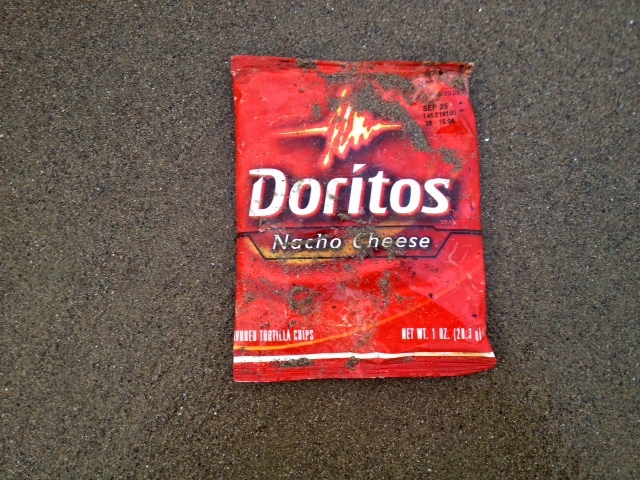 I hope your weekend is beach trash free and that you find some unopened beer. The aftermath of last week’s accident has been relatively pain free. On Monday the insurance company for the driver who caused the crash accepted full liability, so my car is in the shop and I’m driving around in a rented Prius. Thanks, State Farm! Both my mother and brother drive these optimized efficiency vehicles, and they’ve both tried to talk me into getting one. I’ve rejected the idea based solely on aesthetics, because I do not like the way the Prius looks. I like cars that look stylish and feel comfortable, both to drive and ride in, and the Prius doesn’t hold that appeal. I’ve always thought of them as little takeout boxes driven around by our space-traveling future selves. On the con side of things, I am decidedly anti-Prius as a runner because you cannot hear them coming. Yes, I understand that they are running quietly and efficiently. That’s awesome. I am trying to do the same, and I do not want to get hit by a car I cannot hear. Counterpoint – the limited gas usage is amazing. I have a very short drive to work. I shouldn’t drive at all – I should ride my bike every day, and I hope to make that transition soon. The three miles between office and home apparently end up using zero gas in the Prius, according to the little usage metric chart it displays when you conclude your trip. That’s pretty cool. And I love the roomy back area, which is big enough throw a bike in there, no problem at all. I wouldn’t definite the Prius as fun to drive (it feels boxy and not sleek at all, but it still goes fast without feeling like it goes fast, so that’s probably why people get speeding tickets in these things). It makes me nervous because I feel like I’m driving my Mom’s car without her permission and without a parking brake in sight I really do feel like it’s going to just roll away when I stop. Minor gripes aside, it’s a fun alternative to my car and I’m enjoying checking it out. Who knows, maybe I’ll become a convert by the time the repairs are done. But I doubt it. 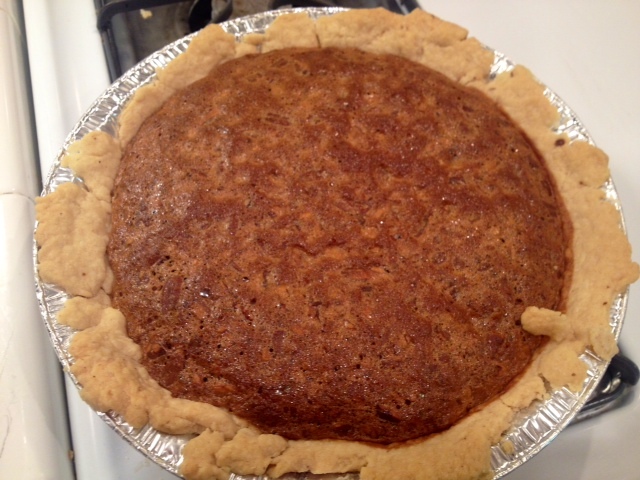 If you like pecan pie, you will also like date and pecan pie, which tastes of yummy Southern gooeyness. I ate a piece of this warm out of the oven last night and despite my apprehension about the dates, it was truly delectable. It would definitely be best served warm with some fresh whipped cream. A great Thanksgiving menu addendum. Saturday morning I went for a very long beach run all the way from Isla Vista to past the Naples surf break, which is about five miles up the coast from I.V. The tide is out far enough now to go all that way on the sand, and it was a beautiful summer morning to be out in the sun, running, thinking about things, and listening to good music. On my way past the beach at Ellwood I noticed that there were lots of whole sand dollars in the surfline. I will often pick up a perfect whole sand dollar, because they feel lucky to me. I’d put them in the same category with pennies found in the road or silver dollar pancakes. You don’t see them very often, and they inspire this perfect little feeling of happiness that is entirely real and pleasant. They’re not always common on the beach here, but maybe this is summer sand dollar season. Lots of luck to go around. 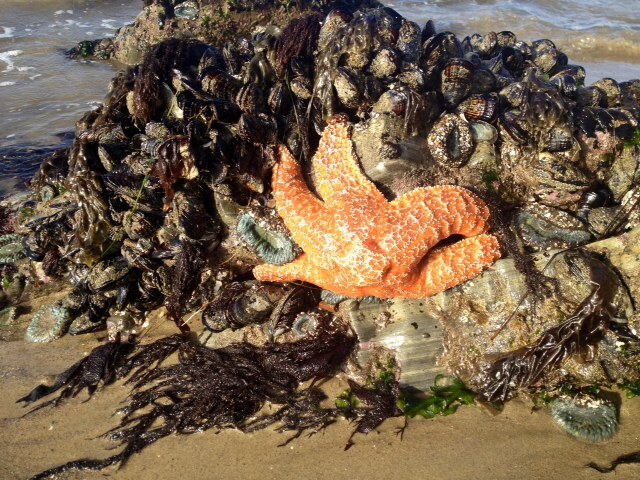 There was no surf to speak of, but there were pelicans, starfish, nice dogs and walkers and plenty of other sights to see. The Bacara looked like a sleepy Meditteranean village perched on a hill. It’s less offensive to me than it used to be, but I really hope the new owners decide to abandon the proposed condominiums that would have major impacts on Haskell’s Beach. The more wild this stretch of coastline stays, the luckier we all are. 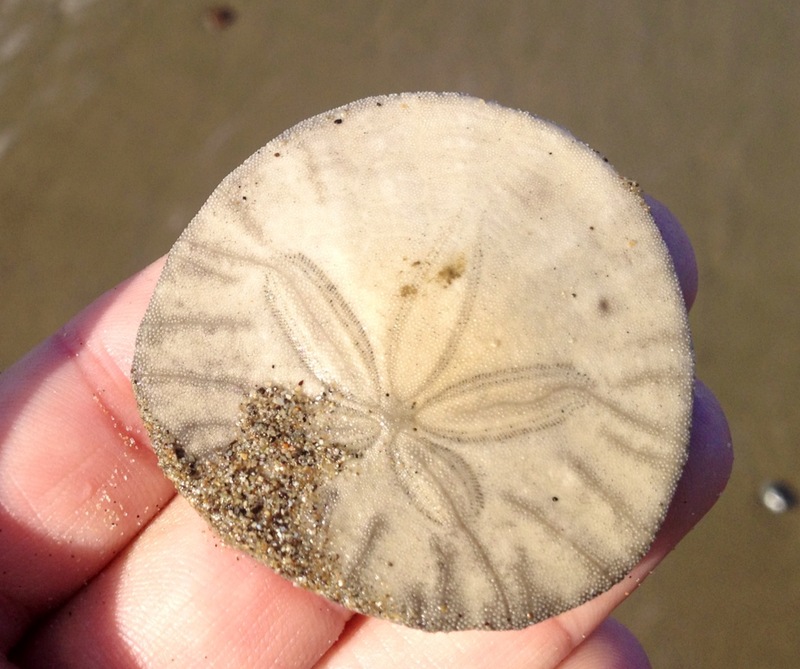 By the way, did you know that sand dollars are also called sand cakes, sea biscuits and cake urchins? Baking and the beach – the perfect combo! 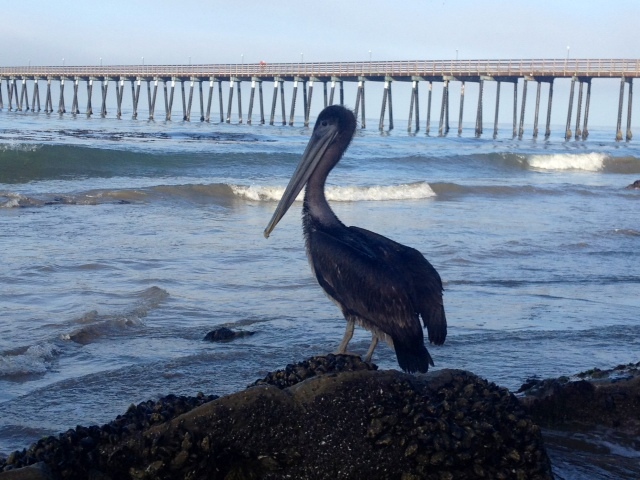 Pelican perch. This guy let me get really close to him without blinking. But he was watching me out of the corner of his eye. If you haven’t seen “Page One: Inside the New York Times,” jump on your Netflix queue and add this documentary to your viewing list. The brilliantly reported 2011 film from Andrew Rossi takes a broad view of the future of journalism, and specifically of that old Gray Lady of the reported word, our national standard for the daily print experience. I continue to rely on the Times for most of my daily news, and so do hundreds of thousands of other intelligent folks out there in America. My only gripe – I’d take a less aggressive stance on the Jayson Blair plagiarism incident, reasoning that most mainstream readers didn’t pay as much attention to the gravity of this offense as us media types did. If you polled even educated readers today on who Jayson Blair might be, I doubt he’d get name recognition above 4-5 percent, if that. Outspoken NYT (“fair-minded, diligent”) reporter David Carr, featured prominently in the film, is one of the most up-front journalists bouncing around today, and viewers get to see him in rapid action in this film. He’s the type of firey journo that is rarely seen these days, and I confess that his simple remarks while driving to a conference at the close of the film “it’s sort of lonely and scary out there. It’s a way of gathering around a campfire and saying ‘we’re all right, aren’t we? Are we OK?’ ‘We’re fine. We must be. We’ve got badges on. '” pretty much summed it all up for me. 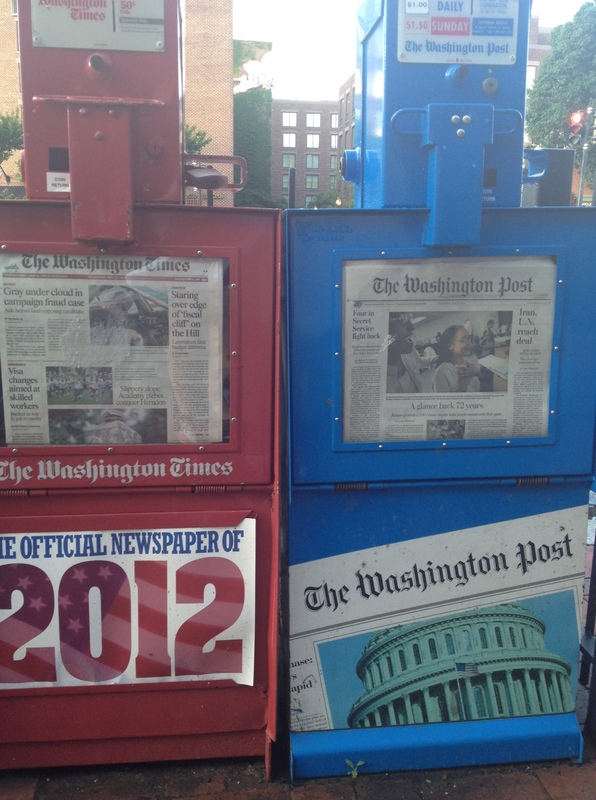 Papers in DC during my May 2012 trip.